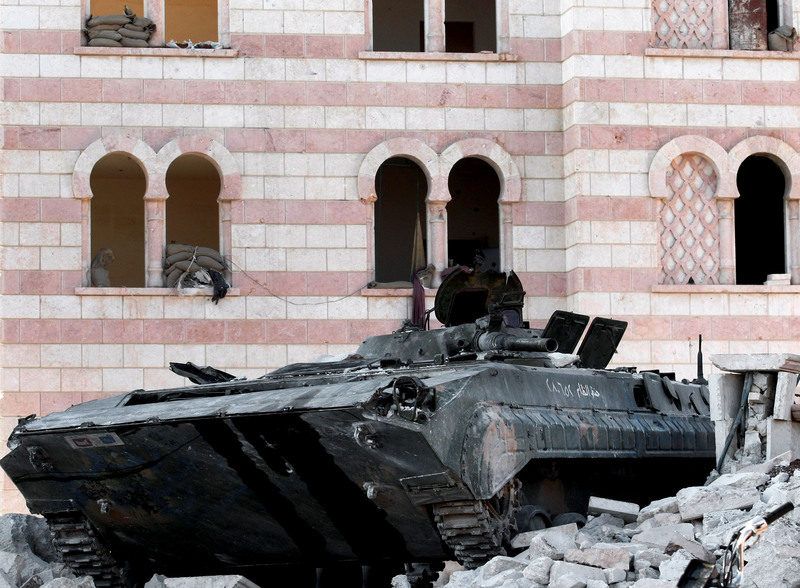 (AP) BEIRUT - Syrian troops rushed dozens of tanks and reinforcements Wednesday toward Aleppo, the country's strategically vital commercial capital, in a bid to crush a rebel advance that has spread to wide swaths of the sprawling city. As five days of fighting in Aleppo intensified, and with rumors swirling of a final showdown in that city, neighboring Turkey tightened its borders but said refugees will be allowed through. "We are expecting a big attack on Aleppo," Mohammed Saeed, an activist based in Aleppo, told The Associated Press. "People are worried they might face random shelling while fleeing." Is al Qaeda fighting in Syria? The rebels have made stunning advances over the past week, but the battle for control of Syria, a geographic and political linchpin at the heart of the Middle East, is far from over. And the potential for wider, regional unrest is great. Israel's foreign minister warned that his country will act immediately if it discovers Islamic militants such as Lebanon's Hezbollah are raiding Syria's chemical or biological weapons stocks. "For us, that's a casus belli, a red line," Avigdor Lieberman told Israel Radio. Israeli officials have reported a run on gas masks. Demand has almost doubled in the past few days, to 4,200 requests on Tuesday from a years-old average of about 2,200, said Merav Lapidot, a spokeswoman for the Israeli postal service, which distributes the masks. On Monday, Syria threatened to unleash its chemical and biological weapons if it faces a foreign attack. The White House said Wednesday that the Syrian government's assault on Aleppo with tanks and fixed-wing aircraft illustrates what it called "the depth of depravity" by Assad's regime. White House spokesman Jay Carney said the administration has seen "credible" reports about the regime's use of military hardware in Aleppo. Carney said Assad was using its forces to "perpetrate heinous violence" against the city's civilian population. Carney also pointed to defections by two Syrian ambassadors as an indication that officials in Assad's circle are "fleeing government because of the heinous actions taken by Assad." Still, after 17 months of fighting and a death toll that activists say has reached 19,000 people, the government remains far better armed than the rebels and willing to launch attacks from the sky, strafing neighborhoods with helicopter gunships. In Aleppo, witnesses also have reported warplanes unleashing sonic booms. The rebels are disorganized and disparate, unable to communicate on a national level or hold territory for long. After a rebel rush on the capital, Damascus, last week  including a brazen bombing that killed four regime insiders  the government routed the fighters by calling in attack helicopters and heavy weapons that devastated entire neighborhoods. Regime forces followed up the shelling with door-to-door searches in Damascus that were still going on Wednesday to flush out remaining rebel sympathizers. The escalating bloodshed prompted two more defections by Syrian diplomats Wednesday  the envoy to Cyprus and her husband, the former ambassador to the United Arab Emirates, according to the opposition Syrian National Council. The announcement follows the televised appearance late Tuesday by Brig. Gen. Manaf Tlass, who confirmed his defection and said Syrians must work together to build a new country. It was his first public appearance since he left Syria earlier this month. French officials later confirmed that he was in France. Tlass is the son of a former Syrian defense minister. Turkey's decision to seal its border to trucks Wednesday comes as fears mount that the 17-month-old crisis in Syria will spread. Syria's close ties to Iran and Hezbollah mean that the conflict has the potential to draw in the country's neighbors. Iran's Defense Minister Ahmad Vahidi said there are no Iranian troops in Syria and that the Syrian government is capable of confronting terrorists  the regime's term for its opponents  the semiofficial Fars news agency reported Wednesday. Vahidi was reacting to reports that accuse Iran of deploying troops in Syria to help quell the armed uprising against Assad's government. Turkey was a Syrian ally before the uprising began in March 2011, but Ankara is now among the harshest critics of Damascus. Turkish territory along the countries' 566-mile (911-kilometer) border is used as a staging ground for rebel fighters as well as a haven for thousands of refugees. Before the uprising began, the border was the transit point for food and construction materials that Turkey exported to the entire Middle East. "We have serious concerns over the safety of Turkish trucks regarding their entry and return from Syria," Turkish Economy Minister Zafer Caglayan said, adding that three border crossings were in rebel hands. Syrians seeking refuge or to resupply would still be allowed in. The battle in Aleppo is just 40 miles (60 kilometers) from the Turkish border. Aleppo is Syria's largest city, with a population of about 3 million. On Wednesday, Saeed, the Aleppo activist, described fierce battles in neighborhoods all over the city, including some near the center. Aleppo's historic old city at the center is a U.N. world heritage site. "Shooting and clashes are going on nonstop," Saeed said. There are no immediate prospects for international action in Syria or the kind of NATO air campaign that tipped the scales against Libya's Muammar Qaddafi. NATO and the U.N. have all but ruled out foreign military intervention, in part out of fears that it would only make the country's problems worse. The U.S. and its allies have shown little appetite for getting involved in another Arab nation in turmoil. Russia, Syria's longtime ally and a veto-wielding member of the U.N. Security Council, has ensured that the kind of U.N. resolutions that allowed Western military action in Libya would not be repeated in Syria. On Wednesday, Russian Foreign Minister Sergei Lavrov criticized new European efforts to enforce an arms embargo as "unilateral sanctions" and a "blockade." The new commander of the U.N. observer force, Lt. Gen. Babacar Gaye, and the U.N. official for peacekeeping operations, HervDe Ladsous, were in Damascus on Wednesday to assess the prospects for a U.N. peace plan that is being widely ignored. Half of the 300-member U.N. observer force, meant to monitor the nonexistent cease-fire, has left the country.